Did you notice the green flag flying in front of the school? Ask an SWS student … he or she can tell you that the flag tells us about today’s air quality. Nurse Jade is leading the Air Quality Flag program at SWS. She and students raise a colored flag daily depending on the air quality that day. The flag helps the school community be aware of the air quality, so that they can adjust their activities accordingly. But for Nurse Jade and SWS staff, outdoor activity is always a priority, and as part of this program students are encouraged to stay active and remember that exercise is important to stay healthy! 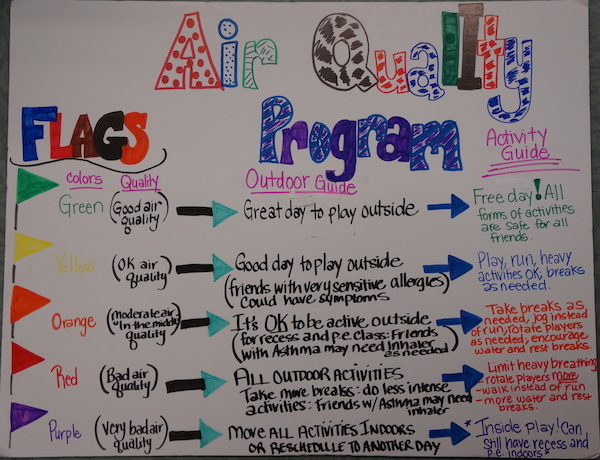 With this program, SWS hopes to reduce the harmful impact outdoor air quality can have on children’s health — and help students be more aware of air quality and the environment around us. For example, on days with poor air quality, students should take more breaks and run less. And in particular, children with airway diagnoses should have their asthma action plan on hand on poor air quality days. Read more about the Air Quality Flag program, sponsored by the Environmental Protection Agency’s (EPA) in partnership with the Mid-Atlantic Center for Children’s Health and the Environment (MACCHE).